Like anything else, time and money are key factors. If time and money weren’t a factor, you wouldn’t be reading this article and be on a long-range boat or some exotic fishing destination. Right? But you’re not. Like most of you, I have to work during the week. These Friday articles will be about where I would choose to spend my time and money, so let’s get to it. Where are you fishing Salty? I’m going out for my first shot at the ghosts this year, Saturday night aboard the Pacific Islander. The problem is, if at this point of the week you aren’t already booked, tough luck. You won’t be going on my trip or any ride for a full day or longer from either Channel Islands Sportfishing or Ventura Sportfishing. I know. I was trying to find a ride for Saturday. Look ahead and reserve your spot. Another option if you want to have a chance at seabass is to fish on one of the overnight boats heading out to Catalina or Clemente. The primary target is still yellowtail, but they are making squid. Anytime you have the candy bait, seabass can happen. As of this writing, you could still get onboard with the Thunderbird out of Davey’s Locker, the Freedom out of 22nd Street, and the Toronado out of Pierpont. Be prepared to do everything from fishing for calico bass, to throwing iron at yellows, to rockfishing. Capt. 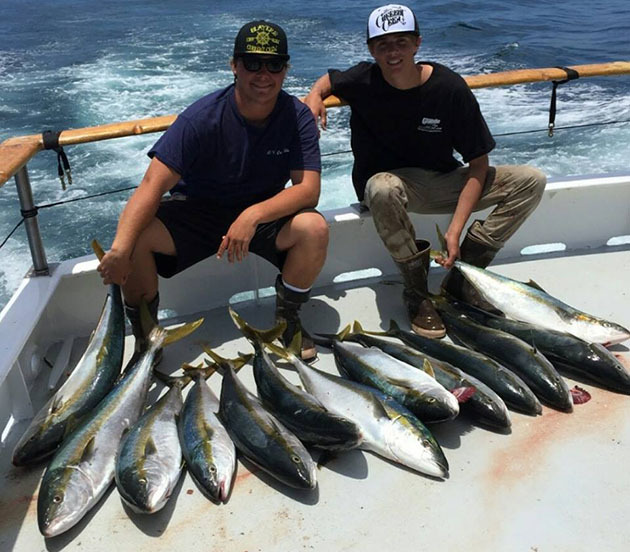 Jeffrey Markland had an amazing day Tuesday on the Thunderbird where they caught 127 Yellowtail, 1 Halibut, 56 Calico Bass, 2 Barracuda, 180 Whitefish, and 102 Rockfish! Busy. Speaking of yellowtail, the 150 did kick out during the week and still presents a viable shot on the cheap. Just be prepared to go elbow to elbow with 50 or so new friends. If you want to give it a go, look at ¾ day boats the Enterprise out of Long Beach Marina, the Victory out of Pierpont, or the Native Sun out of 22nd Street. If all you can fit in is a halfie, the Southern Cal at Pierpont and Monte Carlo out of 22nd Street offer a shot. An alternative ride that I’m really liking right now is the San Diego and Mission Belle. Philip Huber and Justin Cardenas rode the Mission Belle on Monday and slayed. The boat had limits of yellowtail by 11:30am! Usually the weekend rides would be full, but both boats have weekend availability due to the passport requirement. On the offshore front, here’s the deal. You really want to go 1.5 day or longer. That said, it isn’t full speed…yet. The first dodo of the year showed up in the counts this week and the water is over 70 in many spots. The argument for now is those big bluefin aren’t going to stay around forever. If you want a shot at a real trophy, now’s the time. If on the other hand, you are waiting for it to get wide, get together your crew and book your weekend spot for July or August now. Good luck to everyone out there. Talk to you next week. 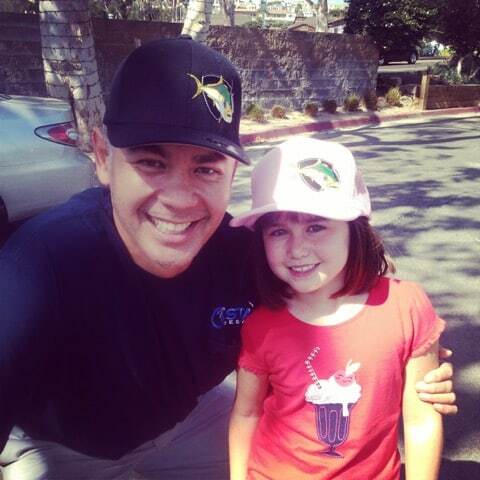 Joe Sarmiento is the founder and primary writer of the So Cal Salty blog. 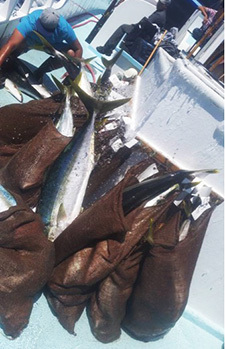 The blog covers saltwater fishing, primarily aboard the many sportfishing boats of Southern California. In addition to writing his blog, Joe's writing has appeared in Western Outdoor News, The Log and Griffin Media. Joe is the father of Jacob and Juliana, and enjoys cooking and eating his catch. When it comes to fishing, I've always been big on theorizing why what works works and what doesn't doesn't.